So, the Doob decomposition is unique and, conversely, the processes A and M constructed according to equation (1) can be seen to be respectively, a predictable process starting from zero and a martingale. For many purposes, this allows us to reduce problems concerning processes in discrete time to simpler statements about martingales and separately about predictable processes. In the case where X is a submartingale then things reduce further as, in this case, A will be an increasing process. The situation is considerably more complicated when looking at processes in continuous time. The extension of the Doob decomposition to continuous time processes, known as the Doob-Meyer decomposition, was an important result historically in the development of stochastic calculus. First, we would usually restrict attention to sufficiently nice modifications of the processes and, in particular, suppose that X is cadlag. When attempting an analogous decomposition to the one above, it is not immediately clear what should be meant by the predictable component. The continuous time predictable processes are defined to be the set of all processes which are measurable with respect to the predictable sigma algebra, which is the sigma algebra generated by the space of processes which are adapted and continuous (or, equivalently, left-continuous). In particular, all continuous and adapted processes are predictable but, due to the existence of continuous martingales such as Brownian motion, this means that decompositions as sums of martingales and predictable processes are not unique. It is therefore necessary to impose further conditions on the term A in the decomposition. 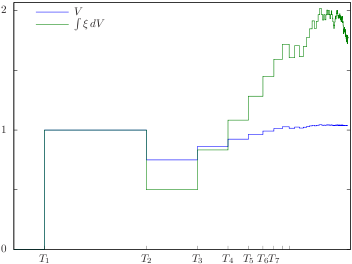 It turns out that we obtain unique decompositions if, in addition to being predictable, A is required to be cadlag with locally finite variation (an FV process). The processes which can be decomposed into a local martingale and a predictable FV process are known as special semimartingales. This is precisely the space of locally integrable semimartingales. As usual, we work with respect to a complete filtered probability space and two stochastic processes are considered to be the same if they are equivalent up to evanescence. X is a locally integrable semimartingale. for a local martingale M and predictable FV process A. Furthermore, choosing , decomposition (2) is unique. A stochastic process is a semimartingale if and only if it can be decomposed as the sum of a local martingale and an FV process. This is stated by the Bichteler-Dellacherie theorem or, alternatively, is often taken as the definition of a semimartingale. For continuous semimartingales, which are the subject of this post, things simplify considerably. The terms in the decomposition can be taken to be continuous, in which case they are also unique. As usual, we work with respect to a complete filtered probability space , all processes are real-valued, and two processes are considered to be the same if they are indistinguishable. for a continuous local martingale M and continuous FV process A. Furthermore, assuming that , decomposition (1) is unique. Proof: As sums of local martingales and FV processes are semimartingales, X is a semimartingale whenever it satisfies the decomposition (1). Furthermore, if were two such decompositions with then is both a local martingale and a continuous FV process. Therefore, is constant, so and . We have shown that is a nonnegative local martingale so, in particular, it is a supermartingale. This gives . Then (2) implies that is zero and, hence, A and are continuous. Using decomposition (1), it can be shown that a predictable process is X-integrable if and only if it is both M-integrable and A-integrable. Then, the integral with respect to X breaks down into the sum of the integrals with respect to M and A. This greatly simplifies the construction of the stochastic integral for continuous semimartingales. The integral with respect to the continuous FV process A is equivalent to Lebesgue-Stieltjes integration along sample paths, and it is possible to construct the integral with respect to the continuous local martingale M for the full set of M-integrable integrands using the Ito isometry. Many introductions to stochastic calculus focus on integration with respect to continuous semimartingales, which is made much easier because of these results. gives the decomposition of into its local martingale and FV terms. In this post, I will give a statement and proof of the Bichteler-Dellacherie theorem describing the space of semimartingales. A semimartingale, as defined in these notes, is a cadlag adapted stochastic process X such that the stochastic integral is well-defined for all bounded predictable integrands . More precisely, an integral should exist which agrees with the explicit expression for elementary integrands, and satisfies bounded convergence in the following sense. If is a uniformly bounded sequence of predictable processes tending to a limit , then in probability as n goes to infinity. If such an integral exists, then it is uniquely defined up to zero probability sets. is bounded in probability, for each . For cadlag adapted processes, it was shown in a previous post that this is both a necessary and sufficient condition to be a semimartingale. Some authors use the property that (1) is bounded in probability as the definition of semimartingales (e.g., Protter, Stochastic Calculus and Differential Equations). The existence of the stochastic integral for arbitrary predictable integrands does not follow particularly easily from this definition, at least, not without using results on extensions of vector valued measures. On the other hand, if you are content to restrict to integrands which are left-continuous with right limits, the integral can be constructed very efficiently and, furthermore, such integrands are sufficient for many uses (integration by parts, Ito’s formula, a large class of stochastic differential equations, etc). It was previously shown in these notes that, if X can be decomposed as for a local martingale M and FV process V then it is possible to construct the stochastic integral, so X is a semimartingale. The importance of the Bichteler-Dellacherie theorem is that it tells us that a process is a semimartingale if and only if it is the sum of a local martingale and an FV process. In fact this was the historical definition used of semimartingales, and is still probably the most common definition. Throughout, we work with respect to a complete filtered probability space , and all processes are real-valued. Theorem 1 (Bichteler-Dellacherie) For a cadlag adapted process X, the following are equivalent. For each , the set given by (1) is bounded in probability. X is the sum of a local martingale and an FV process. Furthermore, the local martingale term in 3 can be taken to be locally bounded.